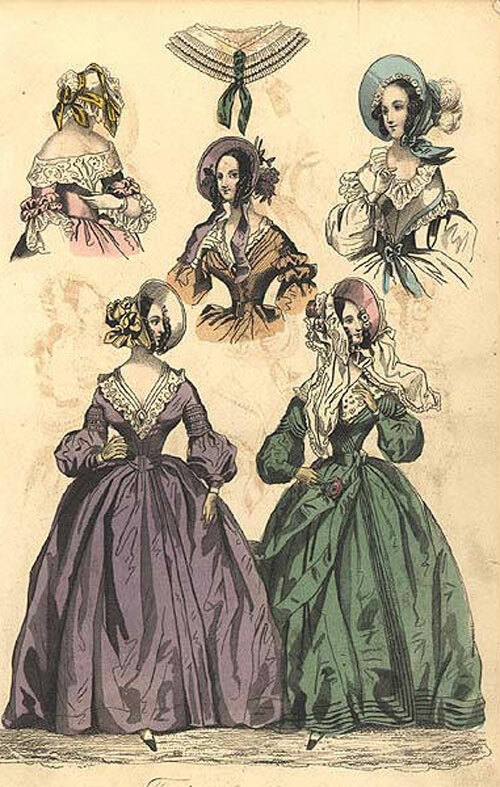 1840s fashion is characterised by low and sloping shoulders, a low pointed waist, and bell-shaped skirts that grew increasingly voluminous throughout the decade. 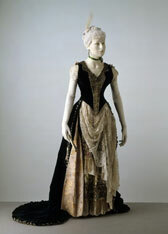 Evening dresses were often off the shoulder. 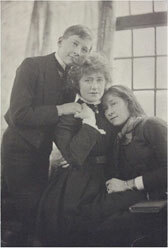 Hair was parted in the centre with ringlets at the side of the head, or styled with loops around the ears and pulled into a bun at the back of the head. 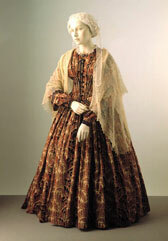 Paisley or crochet shawls were fashionable accessories, as were linen caps with lace frills for indoor wear, and large bonnets for outdoors. 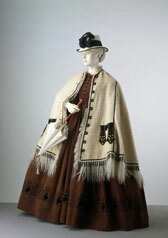 Capes with large collars were fashionable. 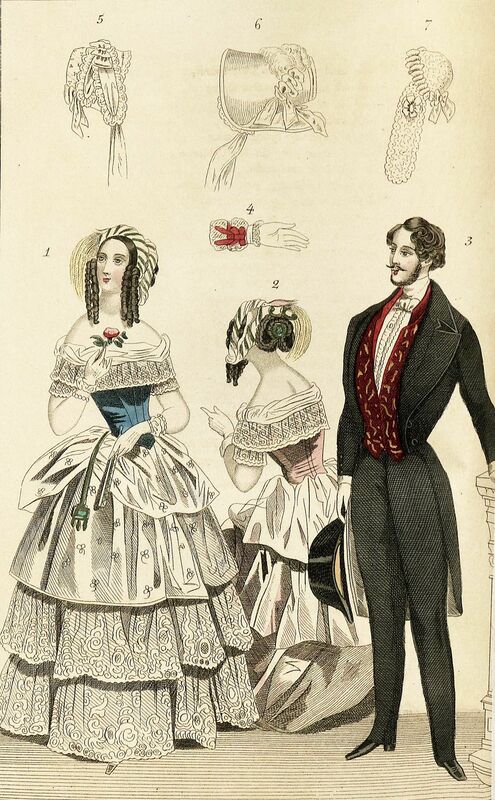 Very fashionable men sported low, tightly cinched waists, with rounded chests and flared frock-coats that gave them a rather hour-glass figure inspired by Prince Albert. 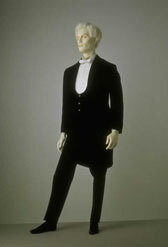 They also wore tight trousers and waistcoats, with high upstanding collars and neckties tied around them. Hair was worn quite long, but swept to the sides. Moustaches and side-burns were popular. 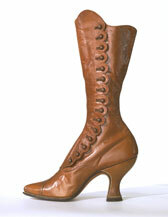 Opera boots were also known as 'Dress Wellingtons' and were often worn when going out to dinner, the theatre, opera and other social evening occasions. 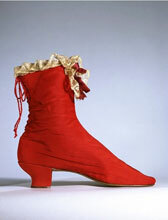 Although they were shaped like a boot, they would have resembled a dress shoe when worn under trousers. 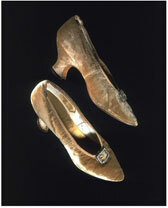 Many opera boots had bows attached, and the uppers were often made of different textures of leather to give the appearance of a dress shoe worn over a stocking. Some even had silk stocking legs laid over the leather to give even more of a stocking-like effect. 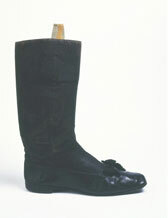 'Dress Wellingtons' were named after Arthur Wellesley, 1st Duke of Wellington (1769-1852). Wellingtons first appeared at the time of the Napoleonic Wars, when the army became more socially visible and military costume influenced fashionable dress. Another boot with military links was the Blucher, a laced boot named after the Prussian General Gebhart von Blucher, who played a decisive role alongside Wellington in the Battle of Waterloo in 1815. 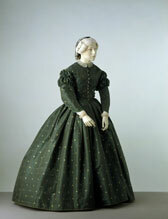 In the 1850s, women's skirts were domed and bell-shaped, supported by crinoline petticoats.They often featured deep flounces or tiers.Long bloomers and pantaloons trimmed with lace were popular.Tiered cape-jackets were fashionable, as were paisley patterned shawls.Deep bonnets were worn and hair was swept into buns or side coils from a centre parting. 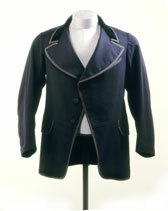 Men wore matching coats, waistcoats and trousers, with hairstyles characterised by large mutton-chop side-burns and moustaches, after the style set by Prince Albert.Shirts had high upstanding collars and were tied at the neck with large bow-ties.High fastening and tight fitting frock coats were also very fashionable; though a new style called the sack coat (a thigh-length, loosely fitted jacket) became popular.The bowler hat was invented around 1850, but was generally seen as a working class hat, while top-hats were favoured by the upper classes. 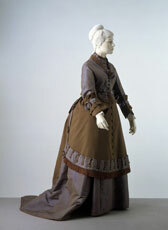 1860s women's dress featured tight bodices with high necks and buttoned fronts. 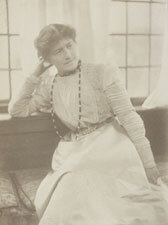 White lace was popular for collars and cuffs, as were low sloping shoulders that flared out into wide sleeves. 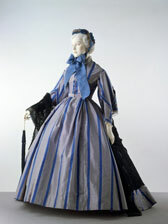 The skirt continued to be full and bell-shaped until around 1865 when it began to lose its volume at the front and move its emphasis towards the back. 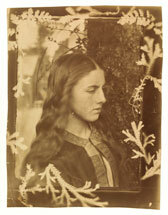 Hair was worn with a centre parting tied into low chignons at the nape of the neck, with loops or ringlets covering the ears. 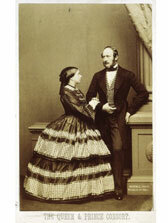 Ornaments for evening wear included floral wreaths, ostrich feathers, pomegranate flowers, wheatears and butterflies. 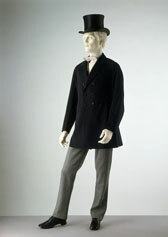 In the 1860s it was fashionable for men's coats and jackets to be single-breasted and semi-fitted, extending to the mid thigh. 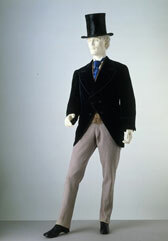 Waistcoats were often collarless and single-breasted, and trousers were occasionally cut from a narrow check cloth. 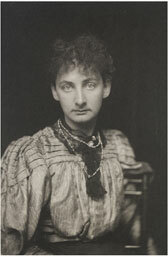 High, starched collars were worn with cravats and neck-ties. 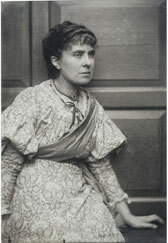 Hair was parted from the centre and moderately waved. A particular hairstyle, known as 'Dundreary whiskers' or 'Piccadilly weepers', were long pendant side-whiskers worn with a full beard and drooping moustache. 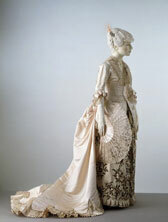 The bride's dress was a focal point just as it is today. 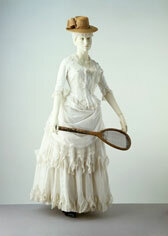 By 1800 it had become usual for her to wear white or cream. 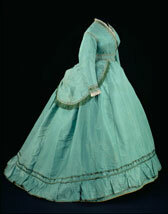 This was a popular colour as it implied purity, cleanliness and social refinement. 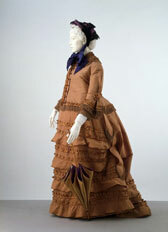 The wide skirt of dress would have been supported underneath by a cage crinoline. 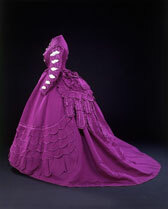 In 1865 cage crinolines protruded out more from behind and were flatter in front in contrast to the bell-shaped crinolines of the 1850s. 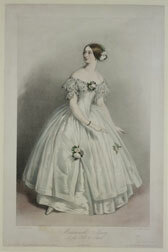 Queen Victoria helped popularise the fashion for white when she got married in 1840. 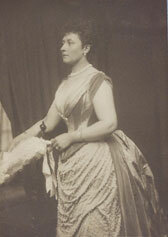 She set a royal precedent by choosing a simple ivory satin dress which was very much in the fashions of the day. 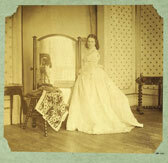 Earlier royal brides had worn white but their dresses were often woven or heavily embroidered with gold or silver. Weddings were one of the most festive social occasions. They gave families the chance to show off their wealth and even less well-off couples would make an effort to dress appropriately. Not everyone, however, wore white. 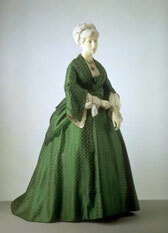 Widows, older brides and the less well-off often preferred more practical coloured gowns. These could then be worn for Sunday best long after the marriage. 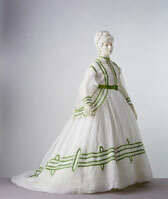 They would not have looked out of place as wedding dresses in the 19th century were designed in line with the current fashions. 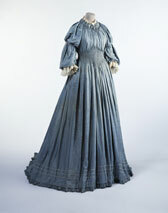 This dress, veil and a pair of boots also in the museum's collection (T.43B, C-1947) were worn by Eliza Penelope Bright, nee Clay (the mother of the donor) for her marriage to Joseph Bright at St James's, Piccadilly on 16th February 1865. 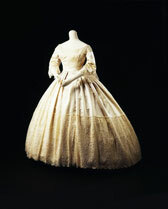 Wedding dresses are one of the rare types of garment for which the name of the wearer and the date of her marriage are often recorded. 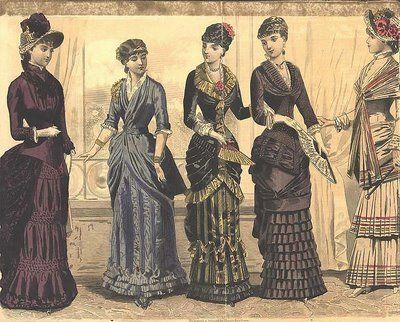 1870s women's fashion placed an emphasis on the back of the skirt, with long trains and fabric draped up into bustles with an abundance of flounces and ruching. 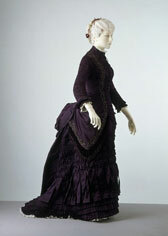 The waist was lower in the 1870s than the 1860s, with an elongated and tight bodice and a flat fronted skirt. 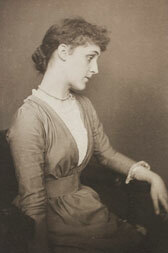 Low, square necklines were fashionable. Hair was dressed high at the back with complicated twists and rolls, falling to the shoulders, adorned with ribbons, bands and decorative combs. 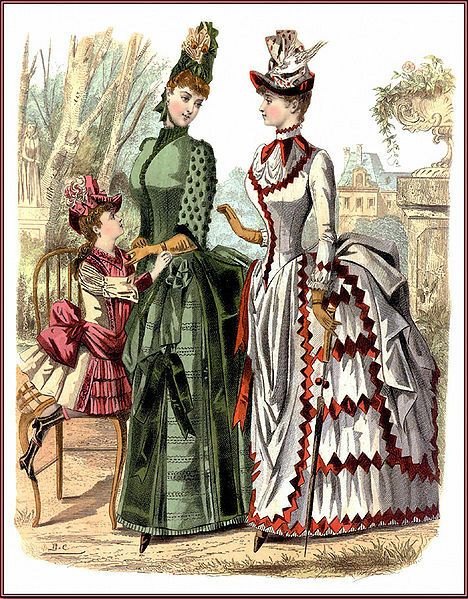 Hats were very small and tilted forward to the forehead. 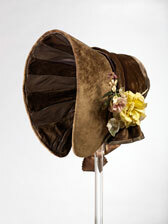 Later in the decade wider brimmed 'picture hats' were also worn, though still tilted forwards. 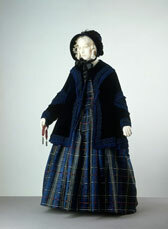 Coats and jackets were semi-fitted and thigh-length. 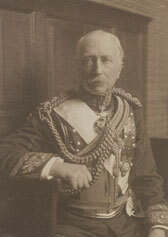 Generally, both jackets and waistcoats were buttoned high on the chest. Shirt collars were stiff and upstanding, with the tips turned down into wings. 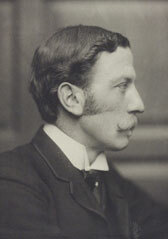 Hair was often worn parted in the centre, and most forms of facial hair were acceptable, though being clean shaven was rare. 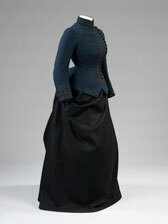 The morning coat was originally a single-breasted tailcoat, worn in the early 19th century, and also known as the riding coat (or 'Newmarket'). 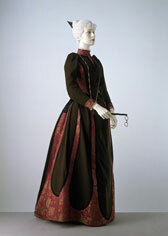 By the 1850s it was shaped halfway between a riding coat and a frock coat. 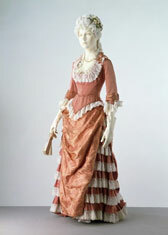 It was usually single-breasted and was known as the 'cutaway', as the fronts sloped away elegantly to the broad skirts behind. 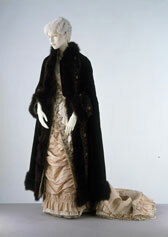 This example is a variation of the morning coat. 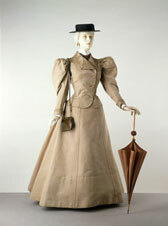 It was introduced in 1870 and was known as the 'University' or 'Angle-fronted' coat. 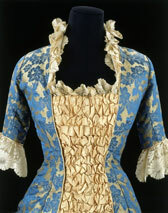 The fronts were cut at an acute angle from the second button, exposing much of the waistcoat. 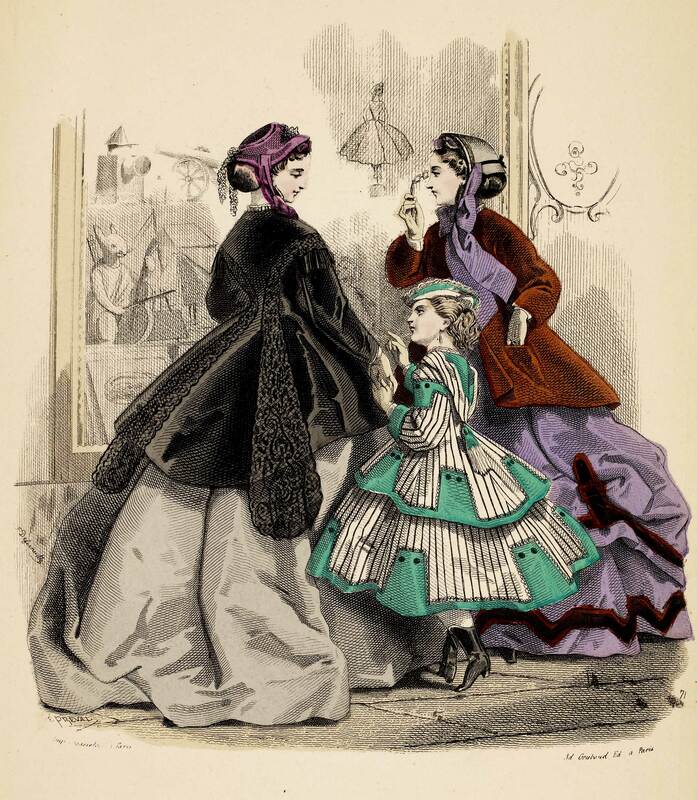 Morning coats were usually made of dark colours, and the fabrics included worsteds, diagonals, hopsack, ribbed meltons and beavers. 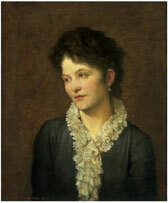 The collars were often faced with velvet and the edges were bound, corded or stitched. 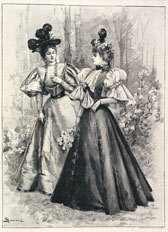 1880s women's dress featured tightly fitting bodices with very narrow sleeves and high necklines, often trimmed at the wrists with white frills or lace. 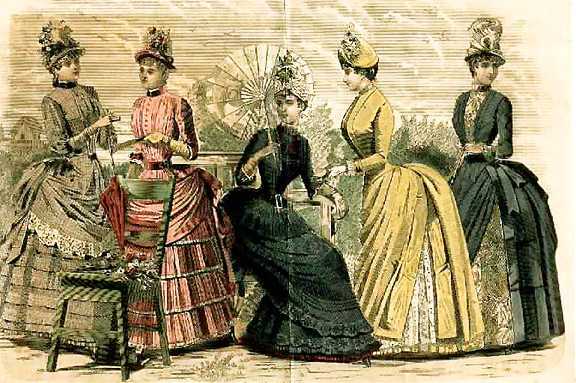 At the beginning of the decade the emphasis was at the back of the skirt, featuring ruching, flouncing, and embellishments such as bows and thick, rich fabrics and trims. 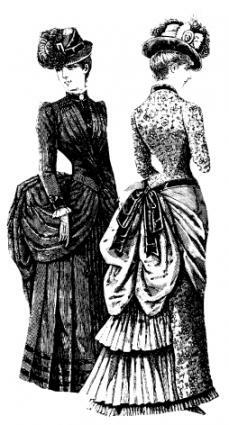 The middle of the decade saw a brief revival of the bustle, which was so exaggerated that the derriere protruded horizontally from the small of the back. 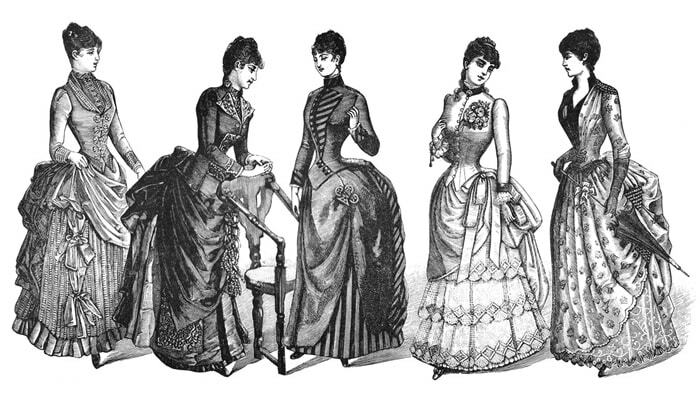 By the end of the decade the bustle disappeared. 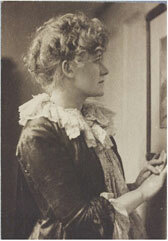 Hair was worn in tight, close curls on the top of the head. 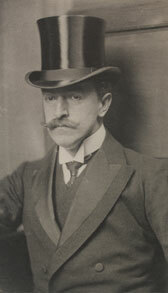 Hats and caps were correspondingly small and neat, to fit on top of the hairstyle. For men, lounge suits were becoming increasingly popular. They were often quite slim, and jackets were worn open or partially undone to reveal the high buttoning waistcoat and watch-chain. Collars were stiff and high, with their tips turned over into wings. Neckties were either the knotted 'four in hand', or versions of the bow-tie tied around the collar. 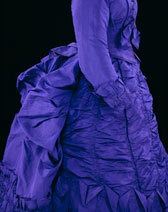 This silk satin evening dress, designed by Charles Frederick Worth, represents the height of couture fashion in the early 1880s. 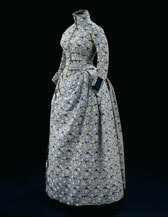 It was worn by Mrs Granville Alexander, a daughter of the U.S. sewing machine pioneer, Isaac Singer. 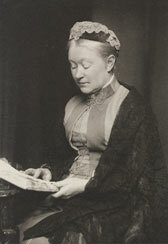 The donor was her great-niece. The bodice is seamed and gored for a moulded fit. 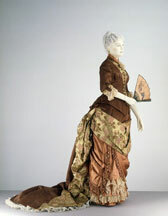 It extends into drapes at the hips and merges with the train, which falls in inverted pleats from the seams of the bodice. 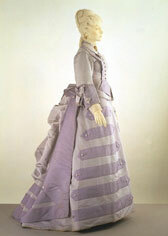 The inside of the skirt is hooped at the back, with tapes for adjustment, to create the bustle effect. The elegant cut, combined with the rich materials and embroidery, makes for a flattering silhouette. 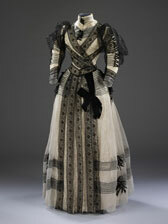 Worth was a celebrated Parisian couture dressmaker. 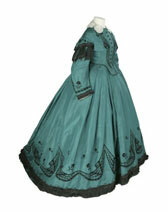 He was born in 1825 in Bourne, Lincolnshire, and started working at the age of 12 in a draper's shop in London. 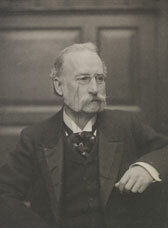 Eight years later he moved to Paris, where he opened his own premises in 1858. 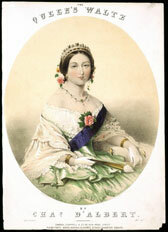 He was soon patronised by the Empress Eugenie and her influence was instrumental to his success. 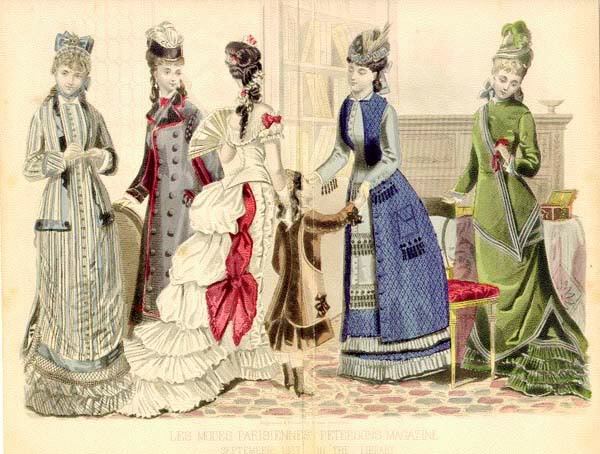 Made-to-measure clothes from Worth, as from the other great Parisian fashion houses, were an important symbol of social and financial advancement. 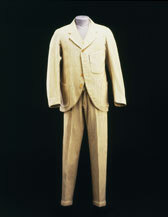 Light-coloured suits such as this became popular from the 1890s. 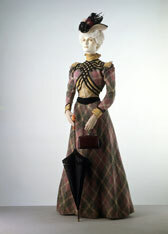 Matching coats, trousers and waistcoats, known as 'dittos', in pin-striped flannel were accepted dress for summer sports and holidays. 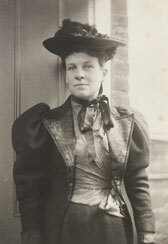 The outfit was often completed with a straw boater. 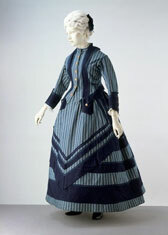 Striped jackets were originally worn for cricket, tennis and rowing and became fashionable for seaside wear during the 1880s. 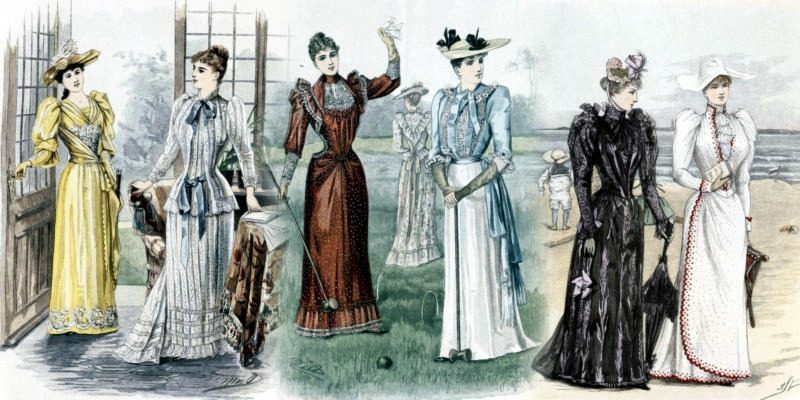 The infiltration of sporting dress into informal styles of clothing shows how social conventions were relaxing in the late 19th century. 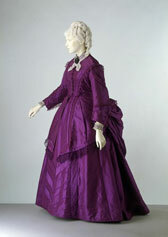 This dress would have been worn for fashionable day wear. 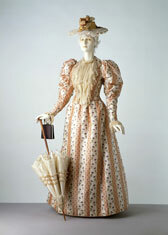 It has a fitted bodice, with a pointed waist, and a frilled collar and cuffs trimmed with gauze and a machine-embroidered border. 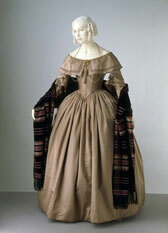 The leg-of-mutton sleeves are long, full, gathered at the shoulders and gauged at the insides of the elbows. 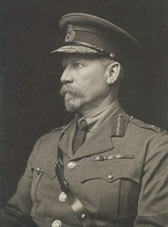 The marked, horizontal emphasis at the shoulder line meant that it was often difficult to wear fitted coats and jackets out of doors. 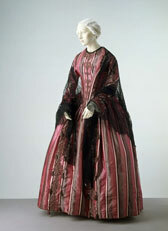 The short, circular cape therefore came into its own for both day and evening wear. 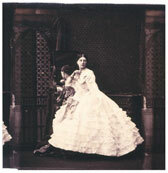 The growth of the sleeve was balanced by an increase in the size of the skirt. 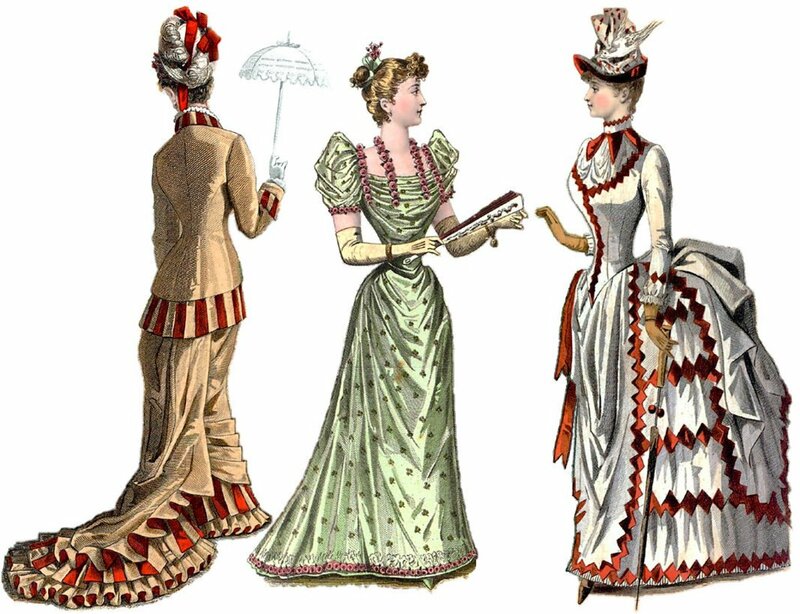 In about 1892, flared skirts were introduced. 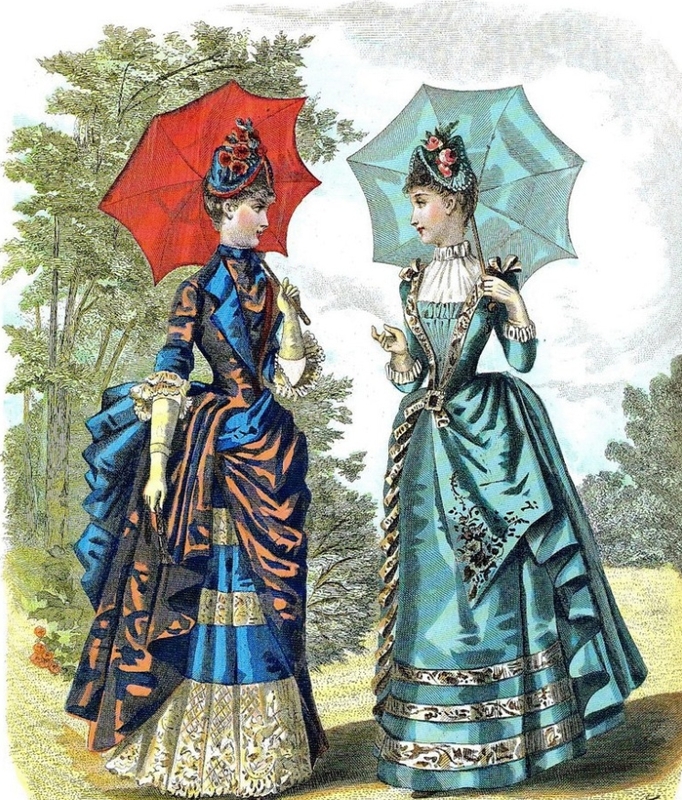 They grew to their widest extent in about 1895, along with the sleeve, and had names such as 'the bell', 'the fan' and 'the umbrella skirt'. 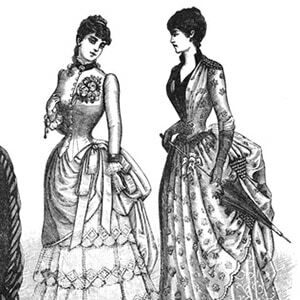 The low collar is an unusual feature, more common towards the end of the 1890s than at the beginning. 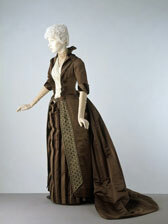 Since the dress has been let out, suggesting a longer period of use, it may be a later alteration. 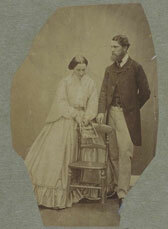 Victorian Durham: what did rich Victorians wear?